Simona Halep heads up the 2017 St. Petersburg Ladies Trophy draw with a bye into the second round. For the second straight year, Halep suffered a first round exit in Melbourne. The Romanian player was hampered by tendinitis in her left knee, the same issue that was bothering her in Singapore. I’m a little surprised to see her in this draw as i’d expected her to take a more extended period of time away from the tour to rest, but hopefully it’s a positive sign. 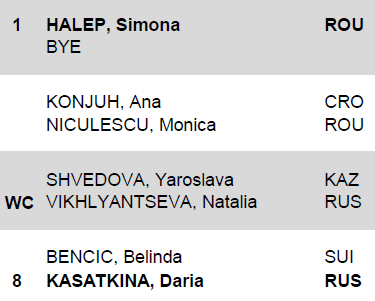 Halep’s first match of the week will be against Ana Konjuh or Monica Niculescu – a tricky opponent either way. Both Konjuh and Niculescu have already reached finals in 2017 and the winner, with a match under their belt, will no doubt present an early challenge for Halep. Another cracker of a first round will see the number eight seed, Daria Kasatkina take on Belinda Bencic. The winner of this match will take on Yaroslava Shvedova or Natalia Vikhlyantseva in the second round. Shvedova is seeking her first win of 2017, while Vikhlyantseva had a decent run in Melbourne, coming through qualifying and winning her first ever main draw match at a Slam. The second quarter of the draw is *currently* spearheaded by the number four seed, Venus Williams – the Australian Open finalist comes with an asterisk but has yet to withdraw so perhaps she is planning to make a quick dash over to Europe with her first match unlikely to be until Wednesday or Thursday. 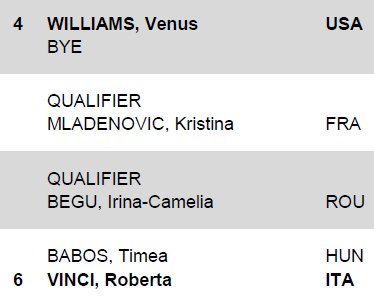 The number six seed and defending champion, Roberta Vinci opens against Timea Babos in the first round. Interestingly, the pair’s last match against each other was in St. Petersburg where Vinci prevailed in what was her most challenging match of the entire week – Babos served for the match but Vinci hung on for the win, 7-6(3) 4-6 7-6(4). Babos will be aiming for her first singles of win in 2017, having gone 0-3 so far in January and losing her first two matches from a set up. Kristina Mladenovic and Irina-Camelia Begu, both starting 2017 in erratic form, will play qualifiers in the first round. Svetlana Kuznetsova will play Daria Gavrilova or Anna Kalinskaya in her first match of the week. Kuznetsova made a solid start to the year down under, winning six matches. The Russian player has been remarkably consistent of late, particularly compared to some of the erratic results she had posted in prior years – Kuznetsova hasn’t lost her first match at a tournament since June last year. 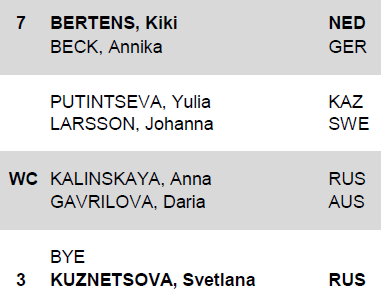 The number seven seed, Kiki Bertens will play Annika Beck once again having recently played in Luxembourg and Hobart. In one of those classic head-scratching WTA head-to-heads, Bertens has won all six previous matches including their last three in straight sets. Furthermore, Beck has lost her last five matches on tour and all in straight sets so seeing Kiki in the draw must have been pretty disheartening. The winner of that match will then play either Yulia Putintseva or Johanna Larsson in the second round. Putintseva didn’t put up a great deal of resistance in a second round loss to Jelena Ostapenko in Melbourne but she certainly has game although her on-court character attracts most of the attention. Dominika Cibulkova rounds out the draw and will play Jelena Ostapenko or a qualifier in the second round. While it is early days for 2017, Cibulkova hasn’t continued her high level from Singapore with a so-so start to the year. Cibulkova lost out in a tough three setter to Ekaterina Makarova in the third round of the Australian Open – it had the makings of a classic Cibulkova comeback after being down and out in the second set, but Makarova hung on for the win in three sets. Cibulkova battled her way out of danger in so many three set matches in 2016 that it was a surprise to see her edged out in that one and she seemed surprised herself in her press conference. This draw has been brutal to some of the Russian players – doubles partners, Elena Vesnina and Ekaterina Makarova are paired up to play in the first round. The winner could play Alizé Cornet in the second round. Cornet defeated Vesnina in their first matches of the year, coming from a set and a break down to win in a third set tiebreak in Brisbane. Two of the qualifiers will join this section of the draw and they could have quite a substantial impact with the likes of Andrea Petkovic, Kirsten Flipkens and Elise Mertens all in contention in the final qualifying round to be played on Monday. Ana Konjuh v Monica Niculescu: I’m not sure you could get two players at such opposite ends of the playing spectrum as in Konjuh and Niculescu. In their only previous match, the huge-hitting Konjuh took time to figure out the wild and wacky game of Niculescu in the final of Nottingham in 2015, winning through, 1-6 6-4 6-2. I think Niculescu is more potent on a fast court but so is Konjuh and if she can keep it reasonably consistent (granted that this didn’t happen in her second round match at the AO vs. Gavrilova), then i’ll think she have enough firepower and options to find a way past Niculescu. Elena Vesnina (5) v Ekaterina Makarova: While Vesnina is the seeded player, Makarova leads the head-to-head, 7-2 including a 6-2 6-1 victory in their most recent match in Beijing. I’m not sure I would take too much notice in that scoreline as Vesnina did seem to be suffering from burn-out at the end of an arduous 2016 season. Makarova picked up her form in Melbourne, as is always the case, but was disappointing in the first two weeks of 2017. Vesnina reached the third round in Melbourne but could have gone a whole lot further with her draw. Vesnina’s only recent win was at Wimbledon where she played a stunning match, sneaking through in an extra-time third set finish. I’d have to go with the head-to-head on this one with all seven of Makarova’s wins coming in straight sets. I’m having great trouble trying to pick between Bencic and Kasatkina, and I think it’s a big match as i’d like the winner’s chances of reaching the final from the top half. Konjuh will be a dark horse but remains to be a little bit of a mystery as she’s thrown in a couple of shockers so far in 2017. Halep is also a question mark with the knee but i’d guess that she will only participate if she is fully fit as she *seemed* to acknowledge after her struggles in 2016 that playing through injuries wasn’t worth it. Vinci’s draw is workable and we know she likes this court surface. I’ll be shocked if Venus makes any impact but it would seem like she is still intending to play if she hasn’t pulled out yet. In the bottom half, I like Kuznetsova to come through… she’s becoming quite a safe pick these days! I’d be surprised if Vesnina and Bertens match their seedings, and i’m concerned with Ostapenko potentially waiting for Cibulkova in the second round. Cibulkova did win their last encounter in Eastbourne quite comfortably (a match I watched live and enjoyed very much! 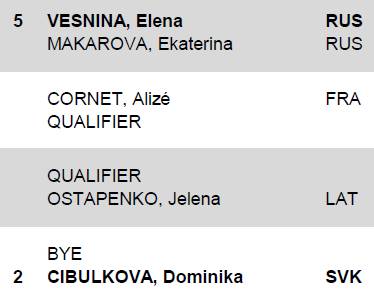 ), but something seems different this year with Ostapenko. While she did crumble on the verge of a big win over Karolina Pliskova in Melbourne, the Latvian player seemed to take the positives out of that match and is maturing after a rollercoaster first-full year on the tour. Who you got in St. Petersburg? Comments always welcome! January 29, 2017 in St. Petersburg, Tournament Preview, WTA. I will enjoy this more than the AO. I was hoping that Belinda Bencic and Daria Kasatkina would meet in the final so I am disappointed that they are playing each other in the first round. I also think that the winner of their match will have a good chance of reaching the final as Halep is suffering from her bad knee and I think that it will be hard for Venus after her excellent AO run. I am going with Daria Kasatkina to win her first WTA tournament and defeat Dominika Cibulkova in the final. Do you even watch tennis lol? Katakana isn’t winning any kind of title soon, wishful thinking bud. Another bigot/troll. The internet is full of them. Feel like giving up on it and just keeping quiet. Glad you can finally watch some tennis, Peter. Bold pick going for Dasha, I like it!